Eagle's syndrome should be kept in mind when the otologist is faced with vague, nonspecific secondary otalgia. The vagueness of symptoms and the infrequent clinical observations are often misleading the clinician to do unnecessary workup, incorrect diagnosis, and wrong treatment. The vagueness of symptoms and the infrequent clinical observations are often misleading the clinician to do unnecessary workup, incorrect diagnosis, and wrong treatment. Eagle's syndrome should be kept in mind when the otologist is faced with vague, nonspecific secondary otalgia. This study was approved by the Inje University Sanggye Paik Hospital institutional review board (IRB. NO. 2015-12-007). A 60-year-old woman complained of intermittent right otalgia for over 2 years. She noticed right otalgia shortly after the right pharyngeal foreign body sensation. Over the years, she had been under the care of various medical specialists. She had underwent a right tympanostomy and ventilation tube insertion 1 year before presentation, without relief of her symptoms. Physical examination of her ear, nose, oropharynx, and neck was unremarkable. 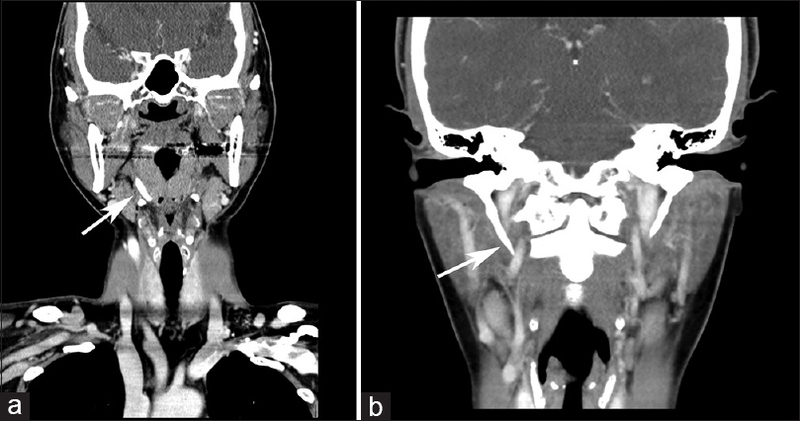 Contrast-enhanced neck computed tomography (CT) images revealed an asymmetrically long 7 cm-sized right temporal styloid process extending to parapharyngeal space at the hyoid bone level [Figure 1]a. On palpation of the right tonsillar fossa, tender elongated styloid process was felt. Palpation elicited pain sensation down her right neck. She was treated with nonsteroidal anti-inflammatory drugs (NSAIDs). She was also suggested about styloidectomy if the symptoms were not relieved. She was lost to follow-up. A 61-year-old woman presented with a 4-month history of the right otalgia. She had consulted with many different medical specialists since. Her pain was not related with masticating or head turning. Contrast-enhanced Neck CT images were not specific except 0.3 cm sized tiny enhancing lesion in the right parotid gland. Follow-up sonoguided fine-needle aspiration cytology compatible with lymphoproliferative lesion. One year later, she revisited our clinic for the complaint of the right neck pain which was aggravating by head turning to the left. Sono-guided fine-needle aspiration cytology revealed reactive hyperplasia. MR images of internal auditory canal were not specific. Two years later, she revisited for the complaint of the right submandibular area pain which was aggravating by head turning to the right. During the oropharyngeal examination, a hard, sharp process was palpated intraorally around the anterior pillar of the right tonsil. The pain was exacerbating by palpation of the lateral tonsillar fossa. Then, the previous neck CT images were reviewed thoroughly, the asymmetrically elongated (3.7 cm vs. 2.4 cm) and slightly medially bent right styloid process was identified [Figure 1]b. Final diagnosis of Eagle's syndrome was made. The condition was explained to the patient and operative treatment was recommended. After right tonsillectomy, styloid process was skeletonized by cone ring curette and removed with bone cutter. On the first postoperative visit, rotation of the head did not elicit any pain. 10 days after surgery, she visited for posttonsillectomy bleeding. Bleeding was controlled by conservative manner. 6 months after the surgery, she was asymptomatic even by neck rotation or palpation. Eagle's syndrome is an important pathology in the differential diagnosis of secondary otalgia. The diagnostic difficulty of this condition is due to the variable and nonspecific vague symptoms. Patients seek diagnosis and treatment in variable clinics such as otology, neurology, dentistry, and even psychiatry. Misdiagnosis of the syndrome can result in various unnecessary workups and treatments. The differential diagnosis of Eagle's syndrome should include tonsillitis, trigeminal, glossopharyngeal and sphenopalatine neuralgia, temporomandibular joint disease, migraine, myofascial pain dysfunction syndrome, laryngopharyngeal reflux, and dental-related problems. Eagle's syndrome should be suspected in the presence of persistent throat pain triggered or exacerbated by head rotation, lingual movement, swallowing, and chewing. In those cases, digital palpation of the tonsillar fossa to provocative the symptoms should be included in the examination process. The styloid muscles are a pyramid shape, the tip of which is formed by the attachment of the styloid muscles to the styloid process. The glossopharyngeal nerve crosses to the anterior side of the stylopharyngeus muscle at the junction of the stylopharyngeus, middle constrictor, and hyoglossal muscles, which are at the base of the pyramid. The middle constrictor muscle forms a wall between the glossopharyngeal nerve and the hypoglossal nerve in this region. Then, the glossopharyngeal nerve gives off a lingual branch and deepens to innervate the pharyngeal mucosa. The nonsurgical treatment of Eagle's syndrome generally involves pharmacotherapy with NSAIDs, anticonvulsant or antidepressants, but the effects are unpromising. Long-lasting symptom relief requires the surgical removal of the long portion of the styloid process. The transoral or recently endoscopic approach involving resection of the styloid process is relatively easy to perform and leaves no external scar. Eagle's syndrome should be kept in mind when the otologist is faced with vague, nonspecific otalgia. Prasad KC, Kamath MP, Reddy KJ, Raju K, Agarwal S. Elongated styloid process (Eagle's syndrome): A clinical study. J Oral Maxillofac Surg 2002;60:171-5.